Contrary to popular belief, science need not be confined to the walls of a lab. You can actually do many brilliant experiments in the comfort of your own home with little or no risk. It is very simple and cost-effective and all you need is some household equipment. It not only allows you to spend some good time with your kids and give them something to impress their friends, but also let them learn knowledge by playing and cultivate their interests in science. 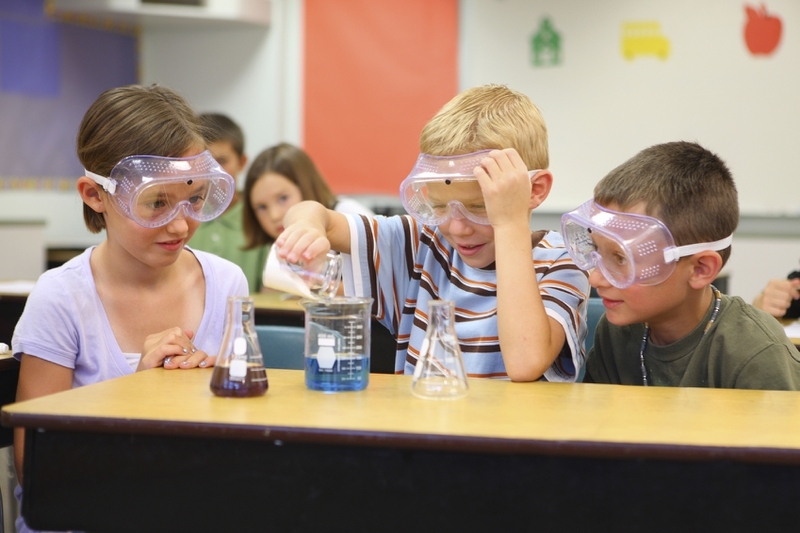 Now let's learn how to do the top 10 science experiments for kids. Take equal parts of baking soda and water and then mix them well. Use either a paintbrush, toothpick or cotton swab to write a message on the paper with the baking soda solution. To read the message, hold the paper close to a bulb. The heat will make the writing turn brown. Get whatever container you are going to use for this experiment. Pour in the heaviest liquid first because the liquids should be arranged in order of their density with the least dense on the top and the densest at the bottom. Make sure you pour the liquids in the following order: honey - corn or pancake syrup - liquid dish washing soap - water - vegetable oil - rubbing alcohol - lamp oil. Avoid having the first liquid run down the container’s sides as it might stick due to its density. One way to do it is to pour the liquid over the back of a spoon. Pour in the rest of the liquids until you are done. You can now use the density column for decoration. Mix water and 95% alcohol in a 1:1 ratio. Add some salt to the solution. Dip the dollar bill into the solution. Use tongs to pick up the bill. Set the bill on fire and wait until the flame dies down. For this experiment to work, you can toss dry chemicals/colorants into a flame, soak some logs in a solution of chemicals or prepare sawdust, cork and pine cones with the chemicals. Put water in a bucket. Make sure it is enough to soak the sawdust, pinecones, waste cork or logs. If the chemical or colorant is in powder form, add it to the water and stir until it dissolves completely. If you’re using waste cork or sawdust, you can add some glue to make the pieces stick together to form large chunks. Add the sawdust, cork, and cones and then mix to form an even coat. If you’re using logs, spread them out and pour the solution on them. Allow the material to soak for a few hours, preferably overnight. Mix the cornstarch and water in a bowl. Take the speaker and place the cookie sheet over it. Pour Oobleck on the cookie sheet. Play the audio test tones. You might need to turn up the volume depending on the frequencies of the tones. You can add some color to the Oobleck to enhance the effects. Put the egg in the jar. Pour vinegar into the jar making sure it is completely covered. Leave it in the vinegar for 2 days. Then take the egg out and shake off the remaining shells, if any. Now enjoy your bounty eggs, but be careful because its membrane is very thin and can't take too much pressure. So bounce your egg gently. Apply a thin layer of glue on the egg shells. Sprinkle some alum powder on the egg shells while the glue is still wet. Make sure you do this to a bunch of eggs at once to avoid having to repeat this process. After the eggs have stayed overnight, you can now make the alum solution. If you want to use dye, stir some into 2 cups of water and then boil the water. Pour about ¾ of the alum powder into the boiled water and stir making sure there are no crystals left at the bottom and the solution is completely saturated. Strain the solution to remove any impurities such as dust and unidentified floaters. Drop the eggshells into the solution. Wait until the next day. Keep putting back the eggshells into the solution if you want the crystals to be bigger. Mix some liquid soap and water in a bucket or dish. Get a straw or bubble wand and dip it into the mixture. A thin film should form at the end of the straw. Take out the straw and place it near the plate. Blow a bubble over the plate. Avoid blowing onto the plate directly. Try your best to place the bubble on the plate. This might require several attempts. Place the plate (with the bubble still on it) in the freezer for about an hour. Keep checking on it every 15 minutes. Remove the plate from the freezer once the bubble has frozen. Make sure it does not crack. Put the pop bottle at the bottom of the kitchen sink. Insert a funnel into the bottle. With the help of the funnel, pour in some baking powder. Add food color and detergent to the cup of vinegar. You can opt to sprinkle glitter in the baking soda. Pour the vinegar solution into the pop bottle and then your volcano will erupt. Tie the string to the middle of the pencil. Take the paper clip and tie it to the other end of the string. Place the pencil on top of the open jar so that the string gets into the jar. Make adjustments so that the string doesn't touch the bottom or the sides of the jar. Remove the string and pencil and put them aside. Boil some water, add sugar to the boiling water and keep stirring until it cannot dissolve any more sugar. Once the solution has reached saturation, pour it into the jar. Now submerge the string into the solution in the jar with the paper clip going in first. Give it time to cool. After a week, you should have crystals.